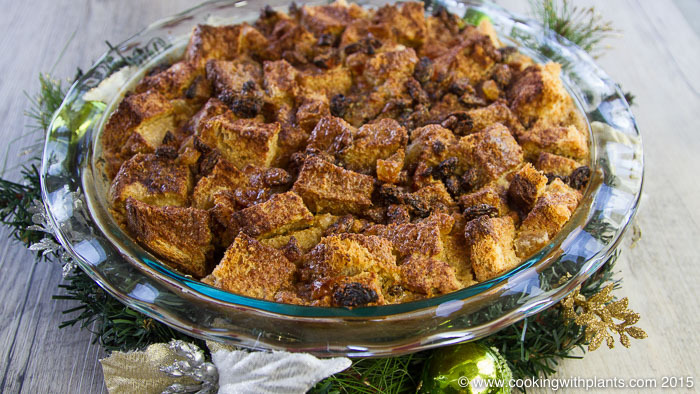 This vegan bread pudding is super fast to make and tastes AMAZING! Great for using up stale bread or any time you want to impress your guests with a vegan dessert that will leave them begging for more. The perfect recipe for christmas or any time you want a rich dessert that is easy to make and tastes fantastic! Place bread (use extra if needed to fill your dish to the top) and dried fruit into a 9.5 inch/24cm round pie dish. Set aside while you make your liquid mixture. Combine all of the liquid mix ingredients in a large blender and blend for a minute or two until the mixture is smooth and creamy. Pour the liquid over the bread and fruit and make sure that all of the bread is well coated in the mixture so the bread doesn't burn while it bakes. Sprinkle with cinnamon and reserved coconut sugar. Place in oven and bake for about 25 minutes or until the top is golden brown and the mixture has firmed up. Keep in mind that it will set more as it cools. Serve hot or cold with a drizzle of extra coconut cream or a scoop of vegan ice cream. Enjoy! Hi Anja, Thanks for sharing this recipe, must give it a go, it looks super tasty. I have some homemade fruit bread in my freezer which should fit the bill nicely. Wishing you and your family a Merry Christmas and Happy New Year, have a wonderful time. Hi Anja, I made this pudding today (along with your amazing smoked paprika cheese) and it was awesome! We almost ate it all in one sitting, we just couldn’t resist. my husband told me that this is his new favorite dessert EVER! Hi Anja, I would like to try this bread pudding, but can other raw nuts such as pecans, walnuts or macadamia nuts be substituted for the cashews? Cannot use almonds either due to sensitivities. Thanks! Hi Anja, would there be any alternatives to make it lower fat? You could try using more oats instead of some of the cashews.